feel good time: new space, clean slate. Yesterday the Zoo and I spent two hours walking people through our Bungalow. It was bittersweet and complete deja vu. It seems like yesterday when him and I were the engaged couple with butterflies and nerves walking through the Bungalow and keeping our fingers crossed that we would get the home. Now here we are spending our last days in it, packing things up, putting away memories and moving forward in life. It's truly bittersweet. Luckily, my emotions are running on low with how hectic life has been with all of my traveling starting tonight and spending the past weekend babysitting my Aunts kids. So I haven't been around much to see everything slowly disappear into boxes, which is most likely, for the best. I will say though, I am a tad bit excited to walk into a home, that is actually ours, we own it and we have a say in everything. It's new space, and quite the clean slate and it gives me a rush of butterflies. With that said, I can't wait to work with the space we'll be given and make it feel clean and brand new. I'm now towards the phase of wanting my living space to feel bright, clean and fresh. This photo above was found on my pinterest and I kind of love the Vanity set-up. 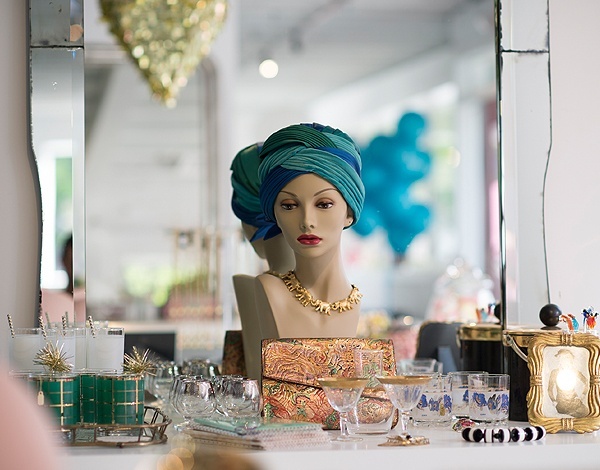 A little bit old hollywood, and though the mannequin may scare others, I am kind of digging it's chic vibe. See? Good things come from moving! This past weekend I was busy watching my Aunts kids while her and her husband took a trip to San Francisco. Let's just say, the kids and the Zoo and I had a complete ball. I love being with my cousins, they allow me to feel like a kid again and deep down, I truly am. I love spending hours playing games in the backyard and racing each other to see you has the best time. I'll post more of our adventures later, but for now, I need to get a move on and clean and pack the house, as I am on quite the timer and I'm boarding a plane tonight for California to reunite with my girlfriends and be a part of Marissa's Wedding. It's going to be beautiful! Just wish the Zoo was able to fly with me! just an old sweet song, keeps georgia on my mind. video footage from the island in ze south. beverly hills and all it's glam.